The Arabic Islamic inscriptions on the Dome of the Rock in Jerusalem are perhaps among the most well-known and well-studied inscriptions in the Western literature. 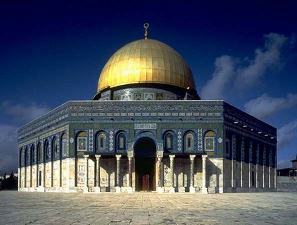 In this short article, we will present the inscriptions on the Dome of the Rock and their translation. Power over all things. Muḥammad is the servant of God and His Messenger. SE Lo! God and His angels shower blessings on the Prophet. His service and is proud, all such will He assemble unto Him. the truth concerning which they doubt. It befitteth not (the Majesty of) God that He should take unto Himself a son. Glory be to Him! W When He decreeth a thing, He saith unto it only: Be! and it is. disbelieveth the revelations of God (will find that) Lo! God is swift at reckoning! is none comparable unto Him. Muḥammad is the Messenger of God, the blessing of God be on him. SW In the name of God, the Merciful the Compassionate. There is no god but God. He is One. He has no associate. Muḥammad is the Messenger of God. Lo! God and His angels shower blessings on the Prophet. the Compassionate. There is no god but God. He is One. He has no associate. on him. May He accept his intercession on the Day of Judgment on behalf of his people. E In the name of God, the Merciful the Compassionate. There is no god but God. He is One. with him. Amen, Lord of the worlds, praise be to God. 72 AH / 692 CE. The inscriptions on the Dome of the Rock can be rightly called as the "big-daddy" of all the first century Islamic inscriptions. These inscriptions are in the mosaics as shown in the figure below. These inscriptions have copious amount of Qur'anic verses. The Dome of the Rock was built by Umayyad caliph ʿAbd al-Malik but the later Caliph al-Ma'mun inserted his name as is evident from the inscription. C. Kessler, "ʿAbd al-Malik's Inscription In The Dome Of The Rock: A Reconsideration", 1970, Journal Of The Royal Asiatic Society, pp. 2-14. M. van Berchem, Matériaux Pour Un Corpus Inscriptionum Arabicarum, 1927, Tome 2 / 2, Mémoires publiés par les membres de l'Institut Français d'archéologie orientale du Caire, Imprimerie de l'Institut français d'archéologie orientale: Le Caire, No. 215, pp. 228-246. K. A. C. Creswell, Early Muslim Architecture: Part 1 Umayyads, A.D. 622-750 With A Contribution On The Mosaics Of The Dome Of The Rock In Jerusalem And Of The Great Mosque In Damascus By Marguerite van Berchem, 1932, Oxford at the Clarendon Press, Plates 6-9, 13-22. S. Nuseibah & O. Grabar, The Dome Of The Rock, 1996, Thames and Hudson: London (UK).